Once in a while, we come across a project whose concept, presentation and execution blow us away. Forresta‘s Bass, Space & Time is one of these. Even more expansive than John Eckhardt’s Forests (a USB stick boxed with forest material), the new LP offers an increased sonic accessibility suitable to the project. The combination of bass guitar and electronics is a hard sell. Not that it’s difficult to enjoy; it’s simply out of the ordinary, and has a tendency to veer toward abstraction. 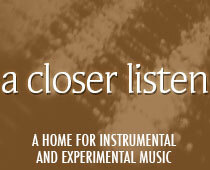 The three components of the new album ~ visual, sonic and conceptual ~ work in complement to provide an essential focus. Over the course of three albums, Eckhardt has come to recognize that a solid entry point is a must. And the entry point for Bass, Space & Time is incredible. Readers can see samples in this article, but that’s just the beginning. The double LP offers 100 different cover choices, each displaying a taste of Eckhardt’s macro forest photography. The box is embroidered, and the vinyl looks like the forest floor. From this presentation, we’re already prepped to hear more about the Swedish forest of Staksund, and about forests in general; I went back to my copy of Peter Wohlleben’s The Hidden Life of Trees as a prose companion, but any flora-related reading will work well. Now to the music, which is much more varied than one might predict. The first track, “Soil”, is a sprawling, ambient field, laden with tiny seeds waiting to sprout. While listening, one thinks of possibilities, not only in the green, but in the bass. The field sounds fertile, its treasures buried, only beginning to poke through to the surface. By holding back, Eckhardt honors the process of germination and growth. This sets up “Subflora”, in which the album shifts from ambient to electronic. At 22 minutes, it’s far too long to be a single, but the potential is there for a club hit: the bass and sub-bass that reflects the sub-flora, the steady tempo that enters and recedes, and the intentional depth of field. The anticipatory stretch beginning in the ninth minute ~ no more tempo, but low drones and suspended tones ~ creates tension in a club, and should a techno producer get their hands on this for a remix, look out. The forest won’t stay still.